We need to reschedule this event for another time. Stay tuned. Join the SF Scooter Girls for another great education event. This clinic is geared for the SCOOTER Community. We don’t want anyone to struggle but to enjoy the sport. Slowing down, and finding your balance is key to a more relaxed ride. Yes, you can still be aggressive. 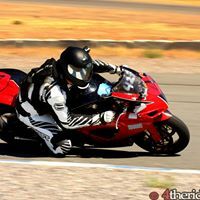 Feel relaxed, and get more enjoyment as we run through skills and drills with motorcycle racer Ethan Nutter, owner of ARC Trackademics. After the clinic we will ride. Ethan owns Accelerated Rider Coaching & Precision Track Days, and he’ll be here with his ARC coaches. We are so excited! As a motorcycle racer, Ethan believes that exercise fitness, and range of motion can be a lifesaver. He’ll help us obtain all of this as he goes over fundamental skills. After class we will ride out Lucas Valley Road to the Marshall store for lunch. From SF, meet at Chevron station on Geary and Arguello at 9am.